There are six species of guinea fowl in Africa. One can also be found in Madagascar and other Indian Ocean Islands. The ones scurrying around the Zoo are the west African subspecies – Numida meleagris galeata. These helmeted guinea fowl are the most widely distributed of guinea fowl and have been domesticated since the time of the Romans. They are noisy, mid-sized birds weighing up to 3 1/2 pounds (1.5 kg). They seem to always have a nervous air about them and they will ‘sound the alarm’ when they sense danger Males (which have a Beardsley Zoo band on their right leg) make a loud “CHI-CHi-Chi-chi” shriek while females make a sound similar to “buck-wheat, buck-wheat.” Young guinea fowl, called keets, do not make the loud noises until they get a little older. Females usually hide their nests and will lay 20 to 30 eggs. They are not considered the best “Moms” because if their nest has been disturbed in any way they will abandon it deserting and eggs and/or keets. Hawks,owls, raccoons, coyote and fox are some of their wild enemies. 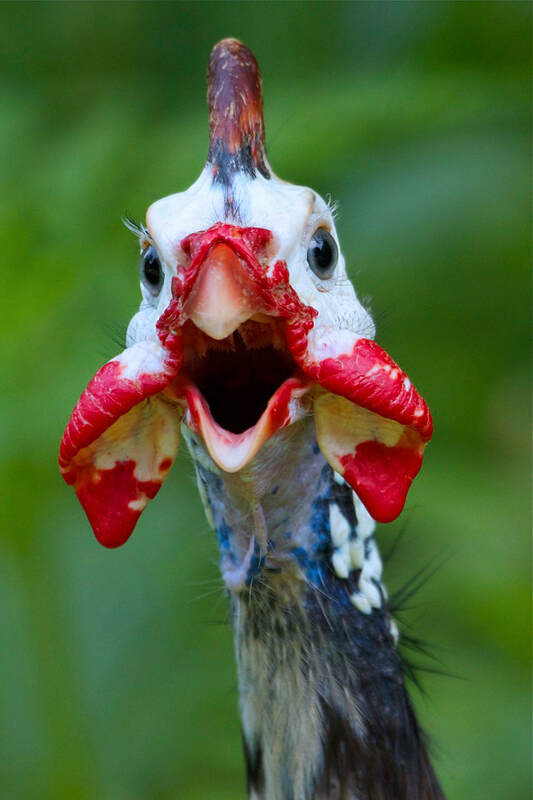 Like the peacock, guinea fowl will roost in trees. Since guinea fowl are domestic they can come in a variety of colors, approximately 20 different varieties. Royal blue, pewter, sky blue, porcelain, buff, white, bronze, violet, chocolate and pearl gray to name a few. Pearl gray is what you will find at Connecticut’s Beardsley Zoo. They are not widely raised commercially, but they are kept on some small farms and act as mobile alarm systems. 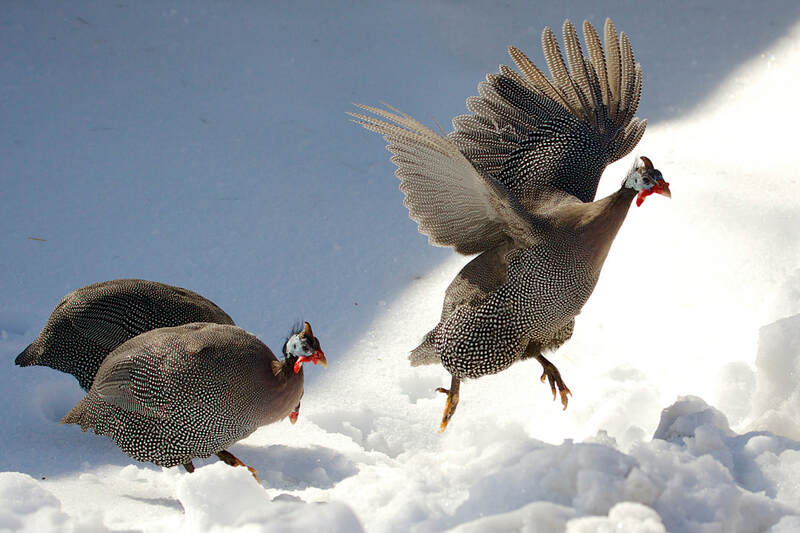 Their wild cousins, the white-breasted guinea fowl, are the most endangered species in Africa. They suffer from habitat destruction and hunting. 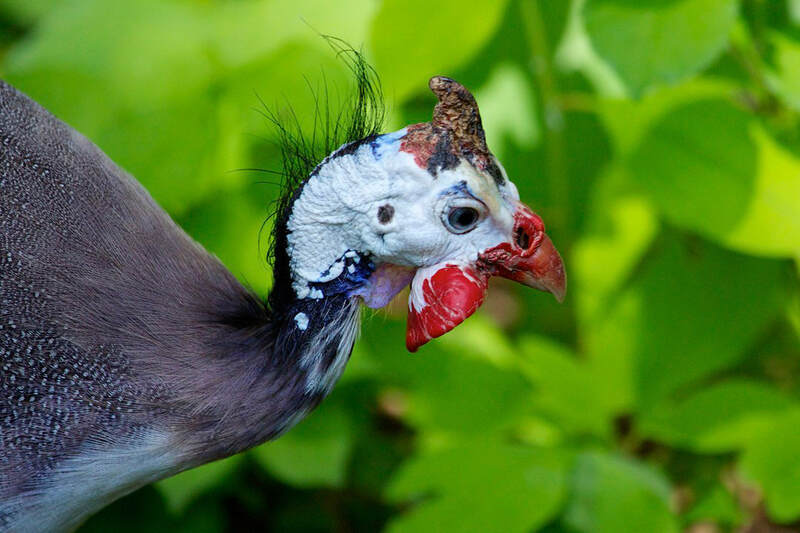 ​The guinea fowl roam the Zoo grounds looking for tasty insects. One of their favorites is Japanese beetles and a second is ticks! Their two “hang-outs” are near the Rainforest and in the New England Farmyard.